Blue Planet 2 Titles BAFTA nominated!! Blue Planet 2 is BAFTA nominated for Titles and Graphic Content. So we went up to the London Hilton yesterday as we got the nomination for best content graphics at the National Royal Television Society awards for our work on War of Words: Soldier Poets of the Somme. We were up against Doctor Who (although why that wasn’t submitted into the effects category I needed explaining to me), and Sports Personality of the Year, the latter of which won out. It’s a crazy process sometimes because you try not to take it too seriously, and when something that is so completely different to your work does win, that becomes easier. We are still so very proud of the work we did, it was a once in a life time job, and a marvellous team effort from Hugh Cowling, Libby Redden, John Durrant, Tim Marriott and Steve Burrell. I’m still working out what this site is for, and I have had it for nearly ten years now. I just want a space that is mine where I can put stuff on my own terms. Also build up a resource and life record of sorts. That’s what these really long posts are for in effect. My ability to write anything was slightly thrown by the events of the last few weeks I have to admit. But it is in times like these that the world need more art not less. So let’s keep going, and communicate and resolve. This week we received the official nomination certificates for the BAFTA for Digital Creativity. 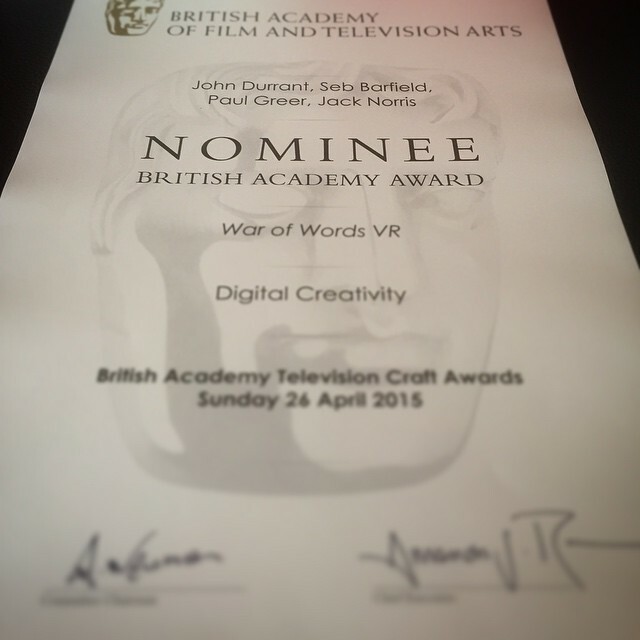 This was for the War of Words VR app that was made by the team at BDH from the some of the animations we made for the War Of Words: Soldier Poets of the Somme documentary I have talked about extensively here. As far as I know the App is still available on iTunes and the Play store. This also reminds me that we picked up two West of England RTS awards recently (during my “blog break”). One for Best Graphics for War of Words and the other for Best Short Animation for The Somme In Seven Poems. It was quite an evening as I wasn’t really sure we’d win anything, let alone two, and beating such greats as Arthur Cox and Aardman Animations. So I had to do two speeches, which was interesting for everyone I think. Hopefully I kept it short and mumbly, because I actually remember nothing about being on stage except a sea of expectant faces and the overwhelming urge to run. Quite an evening. Felt very lucky and blessed that what we worked so hard on was recognised in such a way. That’s the end of the trumpets. In other news I have fired up the old Facebook page to stream sketches and the like, because, even though I am a grown up I still have a problem zapping art in front of people who have friended me there, so it’s a separate place for that. Please follow along if you like Facebook. I’m also trying to restart the daily sketching project, now the dust has settled, but it’s less “daily” more “regular”, I’m still keeping the 365 count as I would like to have some closure on that. They go on Instagram then get sent everywhere else. So probably best not follow me in more than one place because you’ll get repeats and no-one deserves that. Lardy dar at the @RTS_Bristol awards. Last night we were unsuccessful at the BAFTA’s, but an excellent time was had and lot’s of friends from the Frozen Planet team won so there was plenty to celebrate.